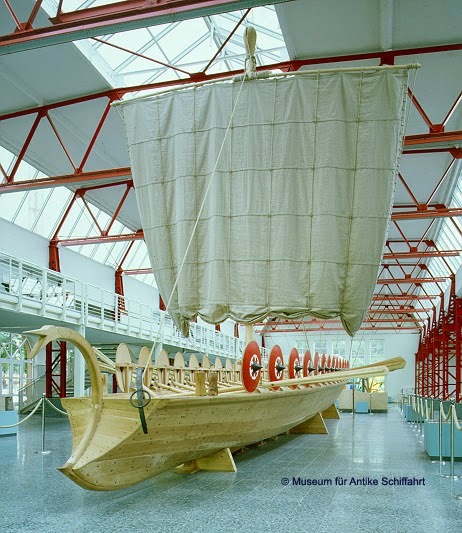 Excavations on the site of the Mainz Hilton discovered eleven fast patrol boats of the Roman navy, which must have been used for defending the Rhine frontier. 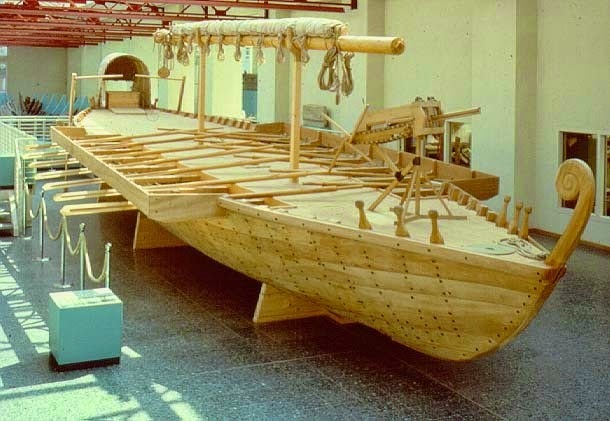 Tree-ring dating of one boat shows that it was constructed in the 370s, and repaired with wood cut in 385 and again in 394. The Roman version of a machine gun, mounted on a fast patrol boat in the Maritime Museum in Mainz. The picture above is of the weapon mounted in the bow of the larger one, a sort of automatic bolt firing ballista, the sort of thing that would spoil any invader's day. The iron tipped "bolts" were fed in from above, each descending in turn as the operators cranked the mechanism. As the drawstring reached its full draw, a trip mechanism allowed an bolt to fall into the firing groove and the action then tripped a release allowing the bolt to be discharged and the cycle started again. These fast patrol boats were stationed at intervals along the Rhine and swept back and forth making sure the "barbarians" to the North didn't cross. All this came to nought in 407 AD when the Rhine froze during a severe winter and an estimated 100,000 barbarians swept into the Empire. Famine and destruction followed and the Empire began to crumble rapidly. By 410 AD Alaric, King of the Visigoths, reached Rome itself and sacked it. In 400 the Rhine, patrolled by ships such as those found recently at Mainz, was still a major dividing line between Roman and barbarian. Certainly some Franks had been ceded land to the west of the mouths of the Rhine, while other Germans captured in the fighting, including Franks, were settled in small groups throughout northern Gaul to serve as recruiting pools for the Roman army. The Franks in particular were just as often allies as enemies: in the late fourth century a number of them rose to be commanders-in-chief of the Roman army and even consuls. But the defensive system in Gaul, set up after the serious inroads made by the Germans in the third century, still functioned well and most of Gaul, governed still from Trier, remained secure from attack. Even in Britain the Roman army and navy successfully repelled a number of attacks by Scotti (as Romans called the Irish), by Britons and Picts from north of Hadrian's Wall, and by sea-borne Germans. Each attack brought fresh refortification in its wake; in 399, Stilicho, the German general who commanded the Roman armies in the west, himself came to Britain to supervise operations. 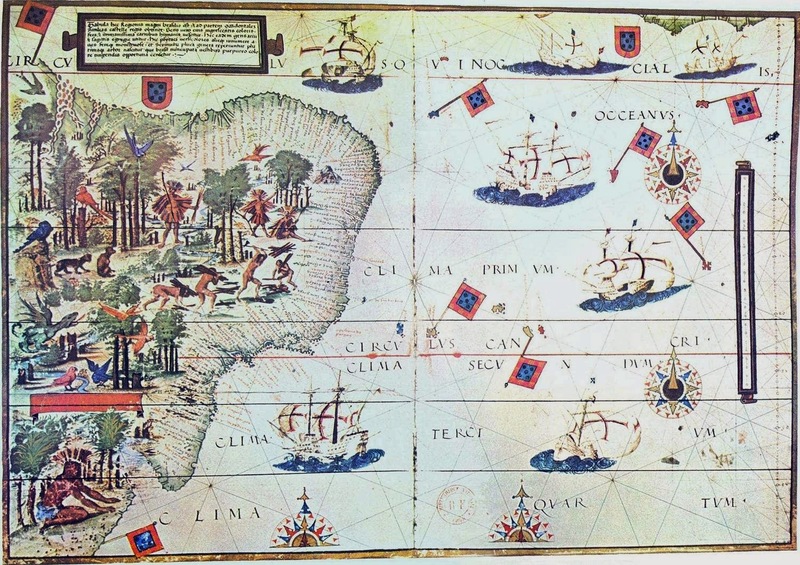 By the middle of the thirteenth century there was a well-established system of usages or maritime law at Barcelona and Tortosa in Spain, and at Marseilles in France, besides similar systems in northern Europe, the laws of Oleron and the laws of Wisby. As may be seen, these laws regulated lading and discharge of cargo, freight charges, contracts, arms, provisions, rescue, tolls, and relations between crew and merchants. The whole may be regarded as a codification of customs which had developed in the period of the Crusades. 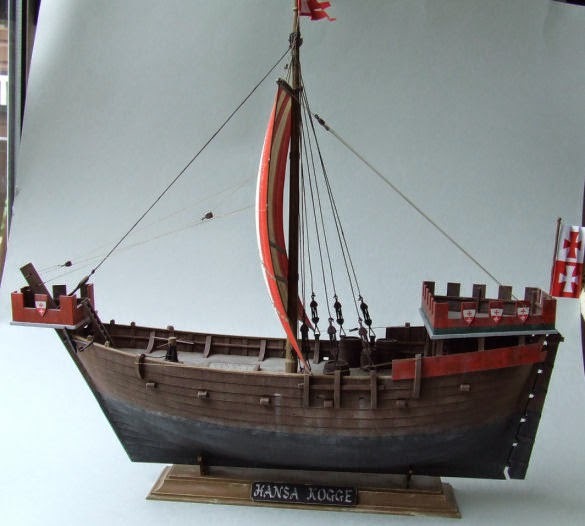 Sailing ships and vessels were used for the carrying trade and both ships and vessels had covered decks.